There are plenty of techniques you can use to clear the clutter. The key is to knowing what kind of clutter you have and devoting chunks of time to organizing it. Everyone has household clutter. From the school paperwork, mail and bills to the books and magazines, the clutter adds up quickly. Here are some tips on how to cut the clutter out of your life to run a more organized household. 1. Have a “home” for everything. Everything you own needs to have designated space, whether that's in a folder, in a specific box in the closet, or a designated drawer. When things don't get a "home," that's when they pile up and clutter accumulates. 2. As you're looking through the mail, put it either into the recycling, in a "to pay" pile (for bills) or a "to file" pile (for important documents and information). Then after you separate it, put everything in a more specific place where it can live until you pay the bills, do the weekly filing, etc. 3. Make changes in your life to eliminate the clutter. If you are a big reader and your massive amount of books bothers you, don’t buy them. Read your books electronically or borrow them from the library. Unsubscribe from magazines that you don't make time to read, and throw out or give them away once you're done reading them. If you find a lot of your clutter are "freebies," then say no to the free t-shirts and coffee mugs that companies like to throw at you. Whatever your clutter consists of, take measures to keep it from entering your home. After all, if it's not there in the first place, then it won't clutter up your home! 4. De-clutter one room or space at a time. For the kitchen, keep only what you use on a daily basis, and consider your cooking habits. If you never bake, then you probably don't need 4 different kinds of cake pans. If your kids are older than 10 years, you probably don't need the plastic dinosaur plates anymore. When assessing your linen closet, ask yourself if you really need five sets of sheets for one bed and 20 towels. In the bathroom, do you need all the miniature hotel lotions and shampoos that you bring home every time you travel? 5. When you are tackling an entire room or space, use the following method. Gather three boxes and the garbage can. Label the boxes “Put Away,” "Give Away/Donate” and “Storage.” The "Put Away" box will house items that need to go to their proper "home" in your house. Items that you don't want or need anymore belong in the "Give Away / Donate" box for donating to charity or giving to grateful friends. Items to be thrown away should go straight in the trash bin. Once you're done organizing the room, it's time to empty the boxes and put each item in its "home." 6. Use a curator's eye for your child's art. It’s difficult to get rid of things your child made for you or their projects from school. The best way to keep all the nostalgia without taking up all the space is to take photos of them and create a scrapbook of the memories. Or for the pieces you really love, how about you actually treat them as art and put them in frames? A gallery wall of your children's art work is a fun and inexpensive way to decorate your home while cutting the clutter. 7. Weed out your wardrobe. After each season is over, go through all the clothes in the house -- from the whole family -- and donate things that don't fit or weren't worn that season. Here's a great tip: hang all your hangers the opposite (awkward) way in your closet. After you’ve worn the particular item on that hanger, turn it the normal way in your closet. After a season or year, the items that are still hung up the wrong way have not been worn and you know it's time to donate them! 8. Do a paper purge in your office! After purchases show up on your monthly statements, it’s okay to toss the paper bills and receipts. However, you certainly do need to keep everything tax-related. For everything else, such as appliance warranties, scan them into your computer or search the internet for the warranty and download the PDF. 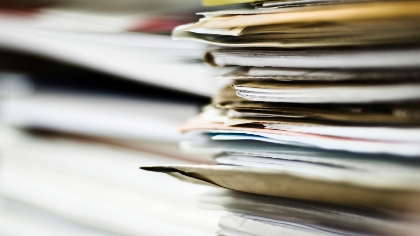 The more paperwork you can store electronically, the better. 9. Small steps can make a big impact. Give away one item a day. Over a year, you’ll give away 365 things and lessen the clutter dramatically! 10. If you have a lot to tackle, schedule 15 minutes a day for decluttering. Try to fill a trash bag of trash or donations in that 15 minutes. Walk around the entire house grabbing things you can do without and see how quickly you can fill a bag. It probably won’t even take the whole 15 minutes. Do this once a week or once a month and you'll see the results! No matter what tip you use -- or maybe you’ll use all of them! -- the idea is to take the first step toward decluttering your house. When you own fewer possessions, there is less to clean, less to organize, and less stress -- but more money and more energy! How you get there is up to you.